Culinary treats on your hike from Atzmännig to Sternenberg. Starting at Atzmännig base station, the trail winds via Altschwand to Chrüzegg (as an alternative take the chairlift and walk towards Harz mountain restaurant and/or Hüttenberg Alpine restaurant as far as Chrüzegg). 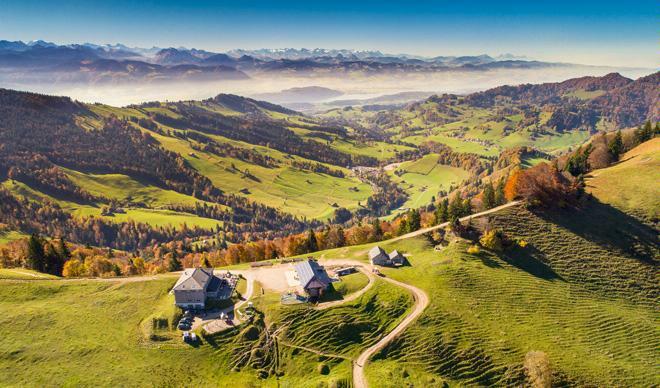 During a first break at the Chrüzegg mountain restaurant you will enjoy the view over Toggenburg. Follow the ridge along Habrütispitz over Rosseg. The path leads over Schindelberghöchi and takes a loop towards Tierhag Alpine restaurant (+41 55 245 12 23) from where you will get to the highest mountain of the Canton Zurich – the Schnebelhorn at 1291m above sea level. Between Schnebelhorn and Hulftegg you will be climbing four peaks. Take your time at Hulftegg restaurant, review the variety of impressions and gather new strength for the second day. As a start on your second day, hiking over Regelsberg you will reach Hörnli mountain, the last peak with a view over the Töss Valley as far as the Alps. Finish the 2-day tour in a convivial setting at the Sternen guesthouse before the bus will take you back to the valley. The three-hour hike starts at the Bärloch parking lot (access only during the week). Follow the little frequented street on a consistent altitude through the hamlets of Vorderstrahlegg and Hinterstrahlegg. This will be your first climb that takes you to Tierhag mountain restaurant (+41 55 245 12 23) where you can take a snack before the final ascent to Schnebelhorn. The view will make you want to stay a little longer but off you go in a loop to Meiersalp mountain restaurant (+41 79 932 87 47). On the way back, you will cross Schnebelhorn peak one more time. Passing Rüti and Vorderschür, you will get back to the trail head. The hike starts at Fälmis (community of Wald). The trail follows the Gerenbach creek through Gerwald to Farneralp. With 300 metres of difference in altitude in your legs, you will be ready for a break. Over the ridge you will get to Schwarzeberg, where you will have reached the highest point of your hike. After the peak, the forest thins out and after a light descent, you will reach Poo Alp mountain restaurant. Don't miss the house speciality for lunch: a tasty cordon bleu! The hike from Marchstein to Wolfsgrueb is easy as it is steadily downhill. Soon you will be facing Alp Scheidegg restaurant - the highest restaurant of the Canton Zurich. The view from the sun deck will fill you with enough energy for the descent via Josenberg back to Fälmis.